We wish to extend a warm invitation to university students on break as well as all AAAP members, guests, AAAP Facebook Fans, Wagman Star Party Fans, Mingo Star Party Fans, etc.! There will be a pre-meeting Meet and Greet in the Planetarium Lobby and inside the Planetarium Theater. The informal show will allow guests to wander into and out of the performance. Roof Star Gazing will be available, weather-permitting. All this at 6:30 PM before the 7:30 PM meeting at the Carnegie Science Center Planetarium-Rooftop Observatory, 1 Allegheny Ave, Pittsburgh, PA 15212. Dress to enjoy the fresh air. A warm alternative to the rooftop will be available inside of the planetarium and in the planetarium lobby. The meeting starts at 7:30 PM in the Planetarium. AAAP members remain for the business meeting after the lecture. Astro Access will be an fascinating lecture on both Space Weather and Astronomy Outreach to the Non-Visual and Autistic Learners by Anna Voelker, whom some of you may know from Pittsburgh and from her TED talks. Anna Voelker, NASA Space Weather Forecaster and Science Educator specializing in astronomy accessibility, uses 3D printing and theatre games to better the reach of science to children who are blind or on the autism spectrum. 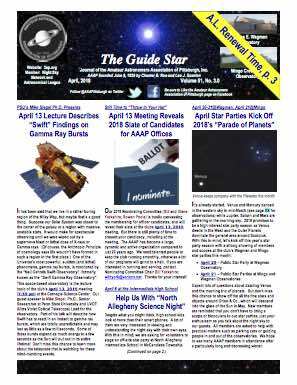 Anna’s outreach has spanned Allegheny Observatory, NASA Goddard Space Flight Center, Space Telescope Science Institute, Center of Science and Industry (COSI), and most recently the NASA Kennedy Space Center. Look forward to a lively and fascinating talk about space weather and how astronomy can be accessible and engaging for all. Anna will share videographic data of solar activity and explain its interpretation and implications here on Earth as well as in Space. As part of Anna’s examples of using non-visual means in astronomy outreach there will be a demonstration of a 3D printer courtesy of the Carnegie Scinece Center Fab Lab. The 3D printer will be tasked to make a tactile globe of the night sky constellations. Rooftop Star Gazing Meet and Greet/Lecture, Free and Open to the Public. $5 Parking Fee by Credit Card only at Parking Lot Exit Gate, only. Please refer to the event flyer. Special Directions Due to Carnegie Science Center Public Construction Closure: 1. Use Lower Level Front Entrance (far left of Service Entrance). 2. Follow planetarium staff to Rangos Elevator, Planetarium, Rooftop. 3. Parking Fee by Credit Card only at Parking Lot Exit Gate. Main Entrance Lobby and Parking Kiosk are closed. Updates on our website at www.3ap.org, on Facebook and Event Flyer Download Link: ( https://tinyurl.com/Jan5AAAP ) . Next Meeting: February 9, 2018, Carnegie Science Planetarium, Program: Annual Planetarium Sky Show. Please check back for details.